Antrim-born actor Liam Neeson is calling upon fledgling New York City Mayor Bill De Blasio to step back from hizzoner's commitment to ban carriage horses from the streets of the city. The carriage trade has, for well more than a century, been largely an Irish franchise, and Neeson has issued his most stinging critique of what he suggests is De Blasio's hypocrisy on the issue, threatening the livelihoods of hundreds of working class carriage drivers and stable hands. You can read more about it in Irish Central. 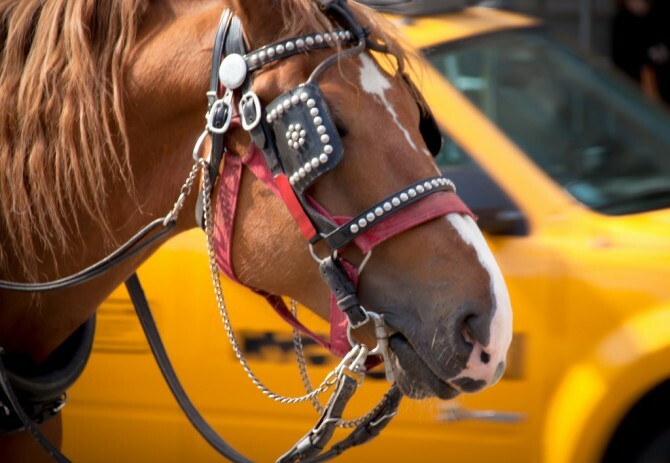 My question to everyone: Are horses ill used as they pull these colorful carriages around Manhattan's Central Park, or are they treated with the respect and care they deserve? I have no first-hand knowledge of how the horses are treated by the NYC carriage owners, but if an unbiased equine charity could be called to inspect and approve the conditions in which the horses live and work, I think it would be foolish to ban them. Again, that's IF the equine charity gave them a passing grade and would agree to make regular inspections. They have inspected and the NYC carriage owners failed inspection. Look it up. When Irish are the underdogs - up with the Irish. But when we are the abusers, we close our eyes to the injustice of which WE are guilty. Of course the horses should be treated humanely, but to say treating them humanely is to ban the use of them at all is ridiculous. They're not human beings, they're horses. There should be some sensibly determined standards, but to ban using a horse to pull a carriage is like banning a boy from throwing a stick in Central Park for his dog to fetch. Pulling a carriage, jumping obstacles, ridden in rodeos, running in races----these are all various activities that are in the nature of a horse at least to the point that it is a domesticated animal. It reminds me of a conversation I once had with a Dakota spiritual leader in Minnesota about his rodeo activities. He said an animal rights activist asked why he was so cruel as to stick his spurs into a bronco or a bull when riding it. "How about because he's a big beast?" was his reply. Not that he abused an animal, but he responsibly respected it as what it is----an animal. So as long as the animal is not treated cruelly within its practical use, no way should its use ever be banned. Yes, and the Irish were just a lower race too, remember your history lessons? Slaves were bred to be slaves and that makes it OK to use them that way? You don't really believe that rodeos are humane do you? Admit you don't care that other animals suffer for your amusement. The point here is that the horses used as carriage horses in NYC are NOT TREATED HUMANELY. The fact that their abusers are Irish makes their cruelty OK with you? Right? Let me begin by stating that I believe the Central Park carriage horses are being well treated. There are always exceptions to the rule and that is why there should be a monitoring system in effect. That said, please note that there has not been a time that these accusations have not been hurled at this group. I remember my dad in the 50's and 60's visiting the stables to see if the accusations were true. His take was that there will always be naysayers but that if he were a horse in NYC, he would be happy to be working under the conditions in place. He felt they led a good life and were retired well. The idea of "slave" conditions was just not true. He said that many "humans" would be happy for the same but unnecessary support of the horses. I find the fact that you are looking for "humane" treatment of the horse hilarilous........They are not "human" But........they are loving creatures and they should be treated well and kindly. I just think this is a repeat of the old situation, Too many well intentioned people finding fault where there is none or the situation is rare. Throw out the dirty bathwater but let us keep the baby. I believe the horses would agree. A stroll in the park with little effort for a horse to pull a carriage of a few people seems to be a task well suited to horses. You don't see the horses worked to a lather or drooling like the parade horses who are tranquilized. I once heard that the sheep dogs when allowed to practice what they are bred for makes the dog well behaved and happy. You can see it in their motion. It is not the motion of a defeated slave, but more the joy of a work partner who is so capable he can make the sheep walk a straight line in single file if need be. I can't say I can tell if a horse is happy, but they seem to be content. Just my opinion. Mr Murphy, Although I respect your thoughts and feelings regarding this issue its apparent to me from all your posts is all you want to do is pick a fight with anyone who will be baited into your non-sensical and unsubstantiated rants. I will not be part of it. You obviously have nothing to do with the industry, you know nothing about the working relationships between humans and animals, you've never been in the stables to see how well treated and love the horses are by their owners, nor are you in any position of decision making influence where anybody would waste time talking to you on this debate. On a personal note you know nothing about my family, where they came from, and how they made a success in America. Before you go shooting your mouth off about things you don't know about I suggest you do your homework, get a true balanced look at the issue at hand and make more educated comments in the future,, You obviously don't know the big picture here so my free advice is do you homework and look at with a clear, objective focus instead of what you "deem to be true". Yes, the sheep march right to the slaughterhouse. How nice for you! Would it be fitting to tell a priest he no longer could preach the gospel. Or a chef from cooking. Or a doctor from healing. The horse, though a beautiful creation from God was made for working. He must feel fulfilled in doing what he was created for. Mr. De Blasio is as far fetched as the rest of his party. He needs to come back to earth.